Gripping and ingenius hostage drama in which mad Roddy holes himself up on top of a building with a machine gun and threatens to decimate a hospital ward from that range unless he gets his ransom. It was great to see Bodie and Murphy team up to try and save the day (about time the latter got in on the action) while Doyle played the tough cop as he investigated Paul Stacey (Karl Howman). The climax is edge of the seat stuff as Roddy gets closer to his money. Not one of my personal favs. Held up on a roof-top bunker, demanding money. Is it really a CI5 job? Oh, and Howman in a frock. I suppose that's Brian Clemens' brand of humour. He liked injecting it into his episodes. I 'get' the comparison with 'Private Madness...' It had all the right ingredience to be a cracker but IMHO the episode didn't hang together. This was certainly one I remembered from original broadcast and thoroughly enjoyed it I must confess. Never really thought 'is this a job for CI5 though?' pp which is a good point. Particularly like the idea of climbing a chimney to get a clear shot though, great stuff. The only thing is about being a bad guy, why would you put yourself up on top of a building where the only way off is with a chopper. Pretty good stuff though nevertheless! That's the point I was making. Acceptable ep but very disjoined. I think there would be difficulties if Roddy and Stacey were holed up in a chopper as maybe the weight of the machine gun and chains of bullets would severly hamper its weight and they could have also ordered it to be shot out of the sky. I liked Bodie and Murphy climbing the chimney in this episode too. Poor old Murphy getting shot, he was always shown on night survellance or told to keep an eye on the street while Bodie and Doyle went into a house of interest. He was in 7 episodes. They never wrote a decent episode for that character. I would have liked the series to expand a bit more with stories about the other agents. Me too. Another CI5 agent who had a lot of potential was Benny (Trevor Adam). He was in Private Madness Public Danger, Stakeout and The Rack. I read somewhere that Steve Alder was brought in as Murphy as a possible replacement if Martin or Lew were a step out of line because at that stage, they were fed up with the show. Yes if 'they' had focused on other agents a bit more, when Shaw and Collins wanted to leave, the show may have been able to continue and possibly develop more. Whenever I saw a group of agents like this in an episode, I'd think who are all that lot ?! Right at the back in the centre is Pat Gorman who was also the murder victim at the golf course in Killer With A Long Arm. You are right about there being not enough character development of the other agents, Karin, although it was nice to see heroic ones like Susan Fischer (The Purging Of CI5) and the lady in You'll Be Alright who was more than capable of looking after herself and helped save that family. We also met some other agents like Cookie in No Stone as well as the only survivor of that quarry hit. I love that pic KarinB, very much all set up colour-wise with the clothes so that the two blokes at the front look different, we look at them as opposed to 'the unimportant extras squad' pretending to look interested at the back. In 'The New Professionals' the extras have been told to busy about a bit and look like they have a pile of really important work to do. Just like when Cowley always says 'where are 3-7 and 4-5?' the same thing happens in The New Professionals with Harry Malone - it's as if the rest of the team are incapable of dealing with [insert current problem here] and the security of the world depends on these two. I also like Murphy at the end of 'Black Out' where he has a life of his own, following Bodie up to the top of the bank - great to see another agent actually involved in some of the action as opposed to be just moving the dialogue along. Murphy also got in on the action near the end of You'll Be Alright. I can remember him jumping from his position after Weaver was shot at inside the family's home. If they had kept Stuart from Blackout, then I could imagine him being more harsher than Doyle in the interrogation scene with Stacey's girlfriend. He would be quite nasty while Doyle was searching the place. Also, I always thought the promo pic of Doyle hanging off a helicopter with a gun in hand was from this ep. I watched this episode on ITV4 today and I actually enjoyed it, I thought it was good. Plenty of suspense, strong performances and ingenious ideas - like going up the chimney. Of course, the whole idea of escaping in a helicopter is flawed from the start but that is more or less true of every hostage story like this, there isn't really a way out without the authorities capitulating which they tend not to do. And Bodie shoots the 'hostage', that's not good. But still a good episode. I watched it too yesterday Gustav and enjoyed it, been a while since I watched this one. An enjoyable episode lots of holes in the plot, but enjoyable. An appearance by Ron Pember also, one of my favourite character actors. The helicopter idea seems daft but I suppose back in the late 70s early 80s you got away with more. I always wondered if Lew actualy climbed the chimney, wouldn't surprise me if he did. Also love the ariel shots of London. For somebody like me who has only been going to London since mid 1990s, it shows the huge change in the place, hard to believe there used to be factories and industrial sites not far from the where us visitors usually roam. I heard that Lew and Steve Alder actually scaled a brick wall to make out as if they were climbing a chimney. Nevertheless, it still looked convincing. This was easily one of Murphy's best moments in the series and he got to fire at the bad guys. When I went to college a few years back, I mentioned this episode to a guy in my class who used to love The Professionals and he said it sounded very far-fetched and highly implausible that someone like Roddy could shoot his machine gun at a hospital ward from that distance. He also thought it was silly to have 2 blokes like B and D running around London with guns and a fast car but at the end of the day, they were special agents and it was entertainment. The only episode I enjoyed Murphy in (wasn't his fault) was 'The Ojuka Situation'. Rubbish title but one of the stronger eps from a fairly dire last series. I think this is a strong episode and one of the most memorable from the 4th Production Block (1980). Murphy was an excellent character and more should have been made of him. As it has previously been mentioned it is shame he was unable to appear in the fifth and last production block in 1981. I think with those last 5 episodes, they wanted to concentrate on just Bodie and Doyle as they knew that Shaw and Collins would not return for another set of episodes. Also at that point, Steve Alder was featuring in another series called The Other 'Arf starring Lorraine Chase and around that time (earlyish 1981), he had a guest spot in Minder episode Rembrandt Doesn't Live Here Anymore. I read somewhere that he was included in The Professionals as a stand-by, in case Martin or Lew stepped out of line. I always remember this one because of Ron Pember tucking into a plate of bacon and eggs. And Stanley Meadows returning to his family after a stretch in prison reminded me of Kibber being released at the start of the Sweeney episode Selected Target. Not long to go now and I can watch this again in restored HD. So looking forward to the new set of Production Blocks 4 & 5. Roll on March. So am I, but I'm also looking forward to Andrew Pixley's companion book. He's going to hopefully reveal all sorts of information about what brought about the decision to renew the series in 1980 and maybe whether they considered other actors to play Murphy besides Steve Alder. This is one of my favorite episodes. The immediacy of the threat posed by the bad guys and the time limit add to the drama. I like Bodie and Murphy climbing the chimney and Doyle threatening the girl into cooperating. 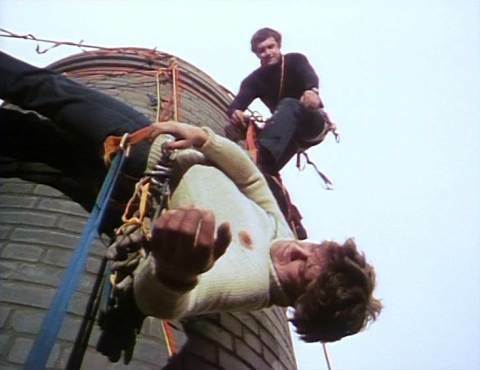 My only real problem with the episode is Cowley not knowing Bodie went off climbing. Granted Cowley was very busy but I think he would have noticed if Bodie wasn't around. Also when he notices and tells him to stop firing at them, I think Cowley deep down inside appreciates what Bodie was trying to accomplish along with Murphy. I think it's a pity we didn't see more of Steve Alder after The Ojuka Situation. According to a novelisation of the story, Bodie spots "hairy forearms"
We are on a roll now with a run of five quality episodes from 'Hijack' on to this good effort. Murphy gets his most meaty role so far in his 6th episode. I suppose CI5 could be involved because of the threat of potential terrorists using those stolen weapons and ammo. The attack on the hospital is brilliantly filmed especially with the blood bag bursting in slow motion. Karl "Jacko" Howman in drag is not a sight for the faint hearted! 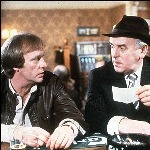 Ron Pember was in a load of shows and tends to play the usual down on his luck working class bloke. The chimney scenes are well shot apart from Murphy's stunt double is balding! I love the fact that the chimney used by Lewis and Steve was only 10 feet high! The shots with the helicopter are also nicely done as are the explosions in the buildings. This was the episode I most wanted to see after reading Dave Rogers book on the series. I had to wait many years to finally see it. It did not disappoint! It was the first episode I watched when I finally got the DVD set. Great episode and one of my top favorites. This one had movie written all over it. It was probably Brian Clemens' original intention when he wrote it back in 1979.